Today’s Ten Things Tuesdays is a little different than usual. Instead of my normal actual things (which I’m making 2014 less about) , I’m talking about 10 blogs that make my life a little better. Ten blogs that I read throughout the week that educate, entertain and inspire me – as well as make me step back and think. Here they are, in no certain order. I hope you’ll find a new read or two that will make your 2014 a little more creative or inspiring. 1. Design Mom – She post on ‘where design and motherhood intersect’ but it’s really also so much more than that. I think what I love about her is she’s real. I do watch her life from my computer screen and think “Wow, she is SO cool and talented! !” But I also watch it and completely relate through her ups and downs. I also love her Living With Kids series. So much fun. Getting to peek into the homes of those around the world is just a blast. 2. The Blog of Tim Ferris – I can’t remember if I first discovered Tim Ferris when I read his book The Four Hour Work Week or when I found his post on How to Lose 20 pounds in 30 Days with No Exercise. Does it work you ask? Well, I didn’t need to lose 20. I wanted to lose about 10 and yes, yes it worked and quickly. I have a comment somewhere in those 6,305. Anyway, I’ve been a long time fan of his. If Tim writes a book, I read it. Seriously, he could write a book about something I hate more than anything…like cage fighting and I would read it. With my eyes closed of course. 3. Money Saving Mom – This blog has a ton of resources if you are wanting to save some money and cut corners here and there. For example, I just downloaded Hugo the movie for free off of iTunes. That’s one of my 9 year old’s favorite movies. Success! I also just scored a 50% off coupon to Michael’s. My daughter is learning how to sew. Hello cheap fabric. Success! She does post a lot of articles and some might not relate to you, but some just might. So give it a try and scroll on through. 4. I Heart Organizing – I pet this blog like it’s a new puppy. Yes, that was a very weird thing to say but I am very weird. If you’ve never visited her blog, you’ll see what I mean. It’s just so pretty and perfect…you just want to curl up with it and pet it. I love the topic of organization and visit her blog for inspiration. If I look around and my house is less than tidy and I have ZERO energy or motivation to do anything about it, one visit to her blog seems to do the trick. 5. Lewis Howes – I love Lewis’ story about how he had a dream he was striving for and then an injury kept him from achieving it. I always, always read a blog’s about page because I want to know where this person is coming from. I want to know their story. Lewis has a great story and it gives you insight into who he is as a person. I love his blog for his podcasts. (Hello, he interviewed Tim Ferris and Gary Vaynerchuck.) I listened to his podcasts while I’m driving or when I have a few minutes alone. Instead of turning on the TV or getting on social media, I’ve been trying to do something that adds value to my life. His podcasts add value. I was just telling my teenage son about Lewis and how I’d like him to start listening to some of his podcasts. He’s the kind of entrepreneur you want to tell your teenage son about. From his business sense to how he’s giving back to the world, he’s just a great role model. 6. Oh Happy Day! – I found this blog because she is the sister of Design Mom. Can you say talented family?! Her DIY party ideas are phenomenal, but more than that they are actually doable. Have you ever visited a blog, saw a fabulous DIY idea and then it was so freaking complicated you wanted to throw in the scissors and never DIY again?Yep, been there. Obviously her DIY ideas have different levels of difficulty, but for the most part I’ve found them doable. And to top it all off, she has THE COOLEST CAR EVER. 7. Rage Against the Minivan – This blog gives me a range of different emotions from day to day. She makes me laugh, think, cry and she just gave me a list of books that she read in 2013 that I just might take a look at. There are so many reasons why I love Kristen’s blog. She’s not afraid to take a topic everyone is talking about and state her opinion boldly and matter-of-factly. She’s not afraid to take on the comments that follow and have a conversation. Which in the blogging and social media world – oh my gosh that can be hard. (Hello trolls.) She also has a beautiful story as a mom. She has four kids via birth and adoption. Her kids have so much character and are full of life. Fun. She’s just fun. I think what I love most about IHOD are her fashion posts. You know how you go on on fashion blog and there’s this really, really weird outfit that you would wear no where? I mean absolutely no where. I know they say mixed prints are in, but if I show up at my local grocery store wearing leopard pants, zebra print shoes and a giraffe print shirt (okay, that’s not what they mean but you get my point right?) people would stare. IHOD’s fashion posts are things I would actually wear and they are gorgeous. I love this outfit. Love. 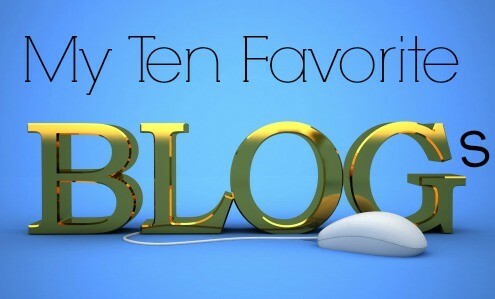 Are any of these blogs on your Top Ten Blog List? Did you find some new ones to add? I hope so! I would also love it if you would share some of your favorites that you read on a weekly basis. I’m always looking for new ones. What a fantastic list! I have certainly found some new blogs to add to my reading list. Thank you for sharing your favourites with us.